Mr. Munir Rana, owner and president of the Alsaba restaurant, poses for The Seoul Times before the interview begins. A new Pakistani-Indian restaurant will soon officially open in Bangbae-dong. Alsaba is located in a spacious basement in Seoul's posh area. Doors will open between late August and early September and promises to be unique in many ways. 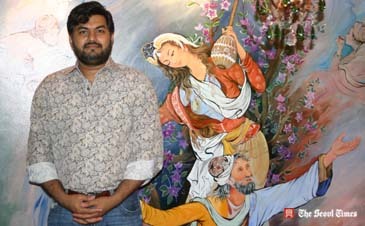 The restaurant aims to promote cultural exchanges between Seoul and Islamabad through Pakistani and Indian cuisine. The menu's variety is another great attraction for customers. 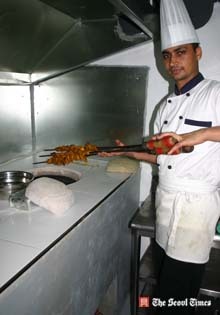 Customers can choose from popular appetisers such as Samosas, Kebabs, and salads. 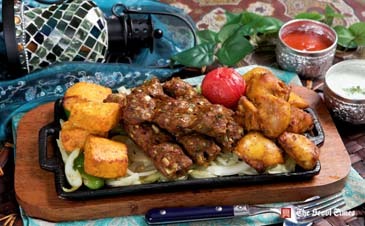 The main dishes on offer is curry, tandoori, BBQ, and steak. According to Mr. Munir Rana, owner and president of the restaurant, Alsaba's signature dish is BBQ lamb cooked in a traditional stove. "For the last 10 years we have developed our own recipe for lamb," said Mr. Rana. "Our customers favor our lamb meat, since our lamb meat doesn't smell at all because of our treatment." The desserts include rice pudding and Gulabjaman (sweet milk balls served in a thick, sugar syrup). Side orders are various naan (a round flatbread made of white flour) and fried rice, both Pakistani-Indian and Korean style. Alsaba's chef is flown from Pakistan. He uses original cooking stove. A set menu and special lunch menu is available and especially convenient for customers with not-so-deep pockets. Non-alcoholic drinks include Alsaba special tea (sweet, aromatic milk tea made from the aranche flower) traditional teas and Lassi (a traditional North-Indian drink comprising a frothy mix of yogurt, salt, and spices). Wine and other alcoholic beverages are also on offer. Compared with the quality of the food, prices are reasonable. An appetiser and main dish for two people cost around 20,000 or 30,000 won while a set of one appetisers and two main dishes - for three or four people - are between 30,000 and 40,000 won. Unlike other Muslim restaurants, Alsaba's dishes are considered as fusion-style food. "Our menu and recipes are different from other restaurants in that they are tailored to the local Korean taste," said Mr. Rana. "For a hot and spicy taste we use Korean red pepper paste - Gochujang." 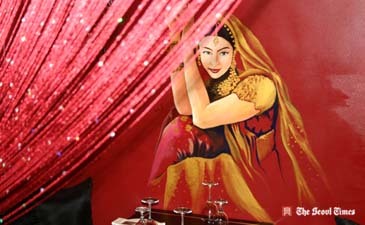 Authentic atmosphere of the new Pakistani-Indian restaurant Alsaba. Interior items were directly flown from Pakistan. He added that Alsaba's chefs are developing their own recipe for Kimchi so that it can go well with their dishes. The venue can also be a boog stage for a variety of cultural events, like belly dancing. The open space comprises some 240 pyong (790 sq. meters) and can accommodate as many as 250 people at once. 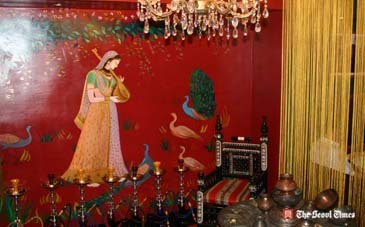 Many of the decor were flown from Pakistan by Mr. Rana's own younger brother. According to Mr Rana, "The authentic and stylish atmosphere is well suited for hosting cultural events particularly embassies of Islamic countries." 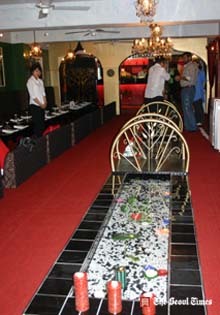 Alsaba has boasts ten staff members, four of whom are centified Pakistani chefs headed by Mr. Javed Gallani. All the waiting staff are well versed in English. Alsaba was first opened in Itaewon in 1994. Shortly after the second Alsaba was opened in Songtan-dong, Osan city in Gyeonggi Province, but closed in the wake of the 2001 September 11 bombing in America. Alsaba's Bangbae-dong branch is the largest in South Korea and the restaurant still draws many local and international customers in the central foreign comminity. Many top foreign envoys - particularly from Islamic countries - are booked to attend the grand opening ceremony. 11:30 a.m. to 2:30 p.m. & 5 p.m. to 10 p.m.
For details or inquiries call at 02-593-1488 or 596-2843.